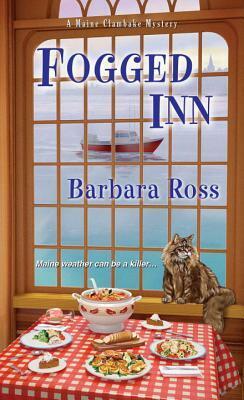 Fogged Inn is the fourth book in A Maine Clambake series and it was very good. There was not one thing I did not enjoy about this book. The characters are well developed, well rounded and three dimensional. Julia and Chris make a good couple, they seem to compliment each other. Both are hard working and are willing to work to make their relationship and dreams come true. I really enjoyed Gus, he was a crusty old guy but was a bit of a softie too. The writing style flows smoothly and the book is an easy read. The author is very talented in describing the characters and the setting with the written word. I was drawn into the book and felt like I was right there, watching all the action take place. I left reality and visited the world created by the author, which is such a great thing. I thought the mystery was well plotted and wove the past and the present together perfectly. I really enjoyed the fact that past actions influenced present day consequences. Quite honestly, there is not one thing I would change about this book and I thought it was an excellent read. I was sad when I finished the book, I wanted to spend more time with Julia and Chris. I would recommend this book to anyone who enjoys a well crafted cozy mystery. This is the first book I have read by this author but I definitely plan on reading the first three in the series. This author has a new fan of her work. I loved it and I can’t wait to read the first 3. They do make some adorable covers, making you want to pick up the book. Thanks so much for doing that. Is there a way to follow Maine Crime Writers? Fogged Inn sounds like a good cozy. I’ll check it out. Thanks for the review. It was a good one, I enjoyed it. I have to read the others in the series. Thanks for stopping by and for commenting.